When setting out on redesigning your vacation rental website, it is far too easy to get caught up only focusing on the visual aspects of the site. By being adamant about SEO from the beginning stages of your redesign, you will save a lot of time and headaches launching a complete, fully optimized website. Many times when launching a new website, new pages are created and some pages are removed altogether. Your new site may not feature the same URL structure as your old website which could cause problems with links on other websites that point to your site. These precious backlinks are very important to your rankings in Google and it is in your best interests to make sure that the links to these old pages are redirected to the new pages. It is near the end of 2014 and there really is no excuse anymore to not make your redesign responsive. There are several benefits to making your new site mobile friendly with a responsive design including faster load times on mobile devices, a better user experience and improved optimization for search engines. 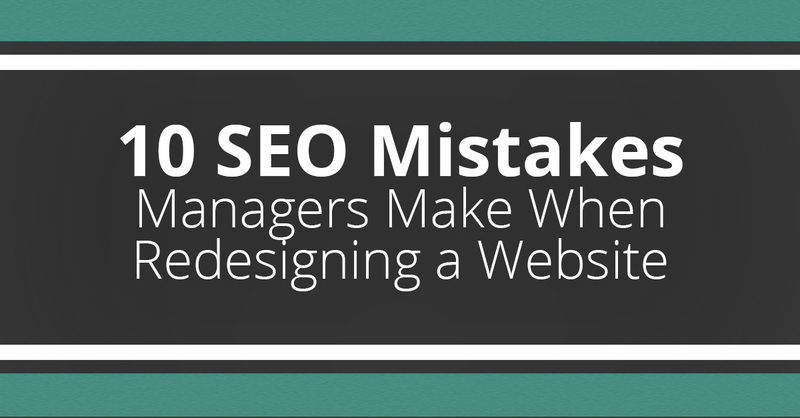 Don’t make the mistake of optimizing your new website only for search engines. Search engines are not your customers, people are, so you should invest time into developing the best user experience possible for your customers. Your pages should have clear call to actions, helpful content and an attractive design. Google Analytics is an extremely helpful tool when analyzing your sites best performing pages and which pages may be lacking. Addressing opportunities you’ve identified and applying them to your new site will greatly improve the performance of your website. Alternatively, you do not want to make the mistake of not including your best performing pages in your new design because you did not consult your analytics. The content of your new website should be clear and easy to read. Pages should target specific topics surrounding your top keywords and provide useful information to your visitors. If you are copying content over from your old site, it is worth the time to go through and make sure your content is up to date and relevant to the newly created pages. If creating content from scratch, keep SEO in mind from the beginning by including appropriate heading tags, keywords and other on-page elements that are relevant to the page before the site goes live. A properly structured website is not only well organized, but also easier for search engines to crawl and identify the most important pages. If your old site is full of lengthy URLs that don’t clearly indicate what the page is about, it is in your best interests to reorganize how your vacation rental website is laid out. An example of a correct URL structure would be something like domain/category/page. 8. Forgetting to Generate a New Sitemap File. You always want to help search engines reindex the new pages of your site and to remove the older pages from their indexes. Once you create a new site full of new pages, your old sitemap file is most likely going to be out of date. By recrawling the new site and generating a new sitemap file that includes all the new pages, you can then upload the file to the live site and submit it to the search engines. Depending on how your development site is set up, an easily overlooked task when launching your new redesigned site is forgetting to unblock search engines from crawling and indexing the new site. Often done within the robots.txt file, forgetting to edit this one line once the new site is live can cause a lot of frustration and confusion as you try to figure out why you’re no longer showing up in the search engine results pages. Another task often overlooked by some developers is transferring the Google Analytics tracking codes from the old site over to the new site. Once the new site is live without Google Analytics you won’t be able to track visitor activity which will cause data discrepancies when comparing month over month. Before launching your new redesigned site, make sure you implement the tracking code for your analytics account to every page you want to track.